Did you know, ﻿according to a Wham-O representative﻿﻿﻿, it is estimated that there are more Frisbee (Flying Disc) sold each year, greater than footballs, basketballs and baseballs combined. These flying discs were bought for a wide variety of reasons. Usually, some people buy flying disc because they just want to play Frisbee, whether in their own backyard or on a school campus. Some buy Frisbee disc because they want to play in their local Ultimate Frisbee or disc golf league. Others purchase them as promotional items to give away during company-sponsored events. 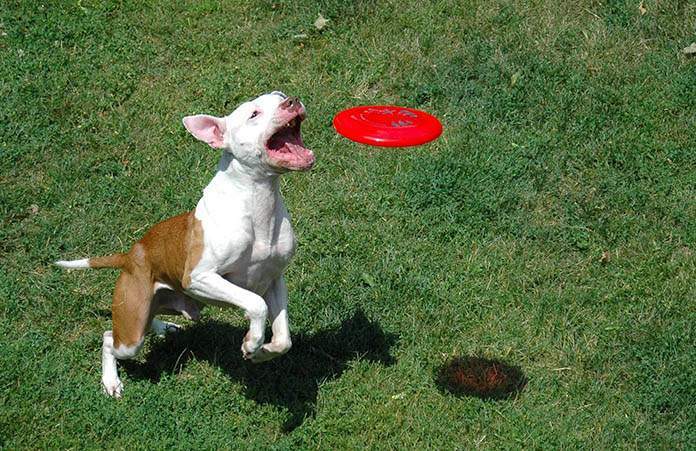 Nonetheless, there’s a fourth category of Frisbee purchasers: those who want to play Frisbee with their dogs. The game is simple, straightforward, and easy to set up—and plus, dogs love to play Frisbee. However, not all dog breeds make an ideal disc dog. In this article, we’ll look at the ten best Frisbee dogs to play flying disc toys and to compete in Frisbee competition. This medium-sized athletic breed of dog—which resembles a greyhound—was most likely bred in the eighteenth century so that hunters could poach rabbits and other small mammals. They were also used in so-called “snap” contests, a canine game focusing on rabbit-hunting (hence their name). English Whippets are agile and dexterous with an average weight of 20 pounds. They were bred for hunting and racing, they have good reflexes and can easily run 35mph to 40mph. On account of these factors, they excel at competitions. If properly socialized, he is happy to spend time with people as well as with other dogs. He loves to exercise regularly; a happy Whippet is one who goes outside to run frequently. When he's spending time in the house, however, he is of a gentle temperament, though this mood can vary to mischievous and jolly if children are present. Whippet is affectionate toward their owners, and enjoy being with them. They are relatively easy to housebreak too. For all of these reasons—their agility, dexterity, affection, and intelligence—they are an excellent breed of dog to play and catch Frisbee. 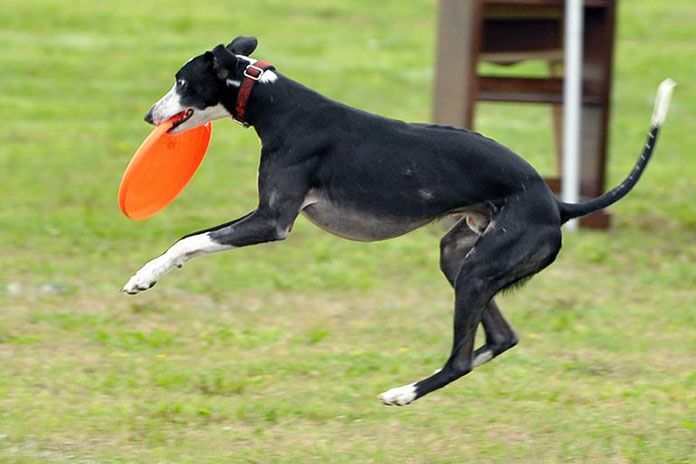 One Whippet, who had particular success playing dog Frisbee, was Ashley Whippet﻿﻿﻿, the first great disc dog. Born in 1971, she first became known at the age of 3, when a university student, Alex Stein, smuggled him into an MLB baseball game. Stein ran onto the baseball field with Ashley and threw Frisbee for him to catch; he leaped nine feet in the air, and the crowd was awed by his skillful disc-catching abilities. 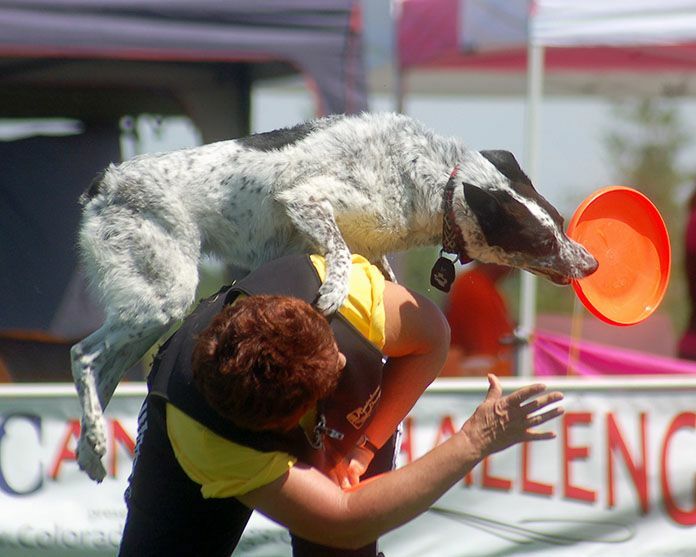 The following year, Stein was heavily involved in the development of the Frisbee Dog World Championship. Guess who won the first three championships in 1975, 1976 and 1977? That’s right: Ashley Whippet. Although the disc dog competition continues to this day, Ashley Whippet remains its most famous contestant. A Border Collie enjoys playing Frisbee in the park. This smart breed of dog is a shepherd's best friend and considered the best herding dog breed in the U.S. Border Collies has a lovely double coat (rough and smooth coat) of black and white, and their fur is water-resistant—well-suited to different environments. Border Collies are very smart and keenly aware of whatever is happening at any given time. He can be easily trained and learns quickly; he is obedient, and will work hard to please his owner. Regarding performance activity, they are very agile and can run fast up to 30 mph. It is for these reasons that border collies are a fantastic option for competitions—yes, even dog disc competition. Being an energetic dog, he requires a sensible amount of daily exercises to help him stay fit and healthy. Border Collies are good family dogs as well. If he is raised properly, he can get along with children, house cats, and other dogs. 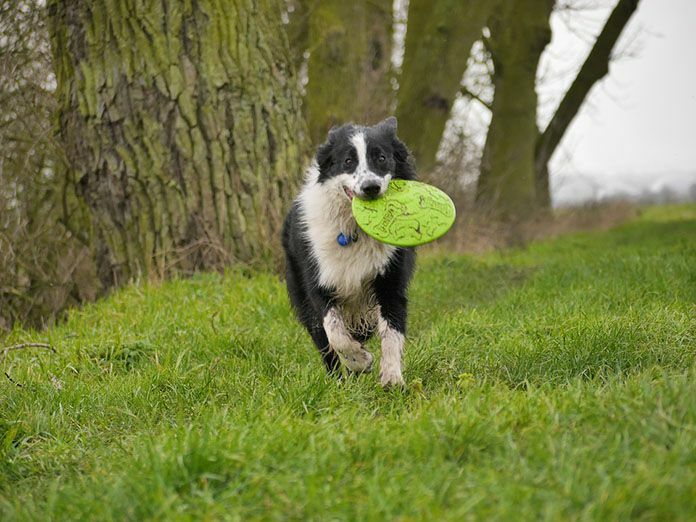 For all of these reasons, a Border Collie is a great choice of Frisbee dog breeds. They will use their speed and energy to catch the Frisbee and run after it; this sport makes it easy for them to stay in shape. Usually, Border Collies need a “job” to be suitably happy and occupied—he sincerely prefers having some way of “serving” you—so playing Frisbee with him is one way of filling that spot. He can enjoy himself while feeling like he's helping you out, and in return, you get to spend some quality time with your pet. Yellow Labrador Retriever plays flying disc. This popular, athletic breed of dogs which originated in Newfoundland, in Atlantic Canada is the number-one dog breed for many breeders and organizations. They are originally bred to help local fishermen out by hauling nets, getting escaped fish, and bringing ropes to the sailors. Labrador Retrievers are muscular and adapted to playing dog sports, such as Frisbee and fetch. They are people-oriented; they love spending time with their owners. Like Border Collies, he is happier if he has duties to do so that he can feel like he's needed and loved. Labrador Retrievers are devoted dogs; he loves spending time with their owner, towards whom he is loyal. For this reason, they are a good choice for families. Because of their patient, highly sociable, and sweet nature, this breed makes a good candidate as a therapy dog and is well-suited to assisting people who have disabilities. The Labrador is highly amenable; you can easily convince him to do what you like, such as visiting someone’s house. Moreover, he's agile and dexterous, so he has no trouble catching the Frisbee and bringing it to you. 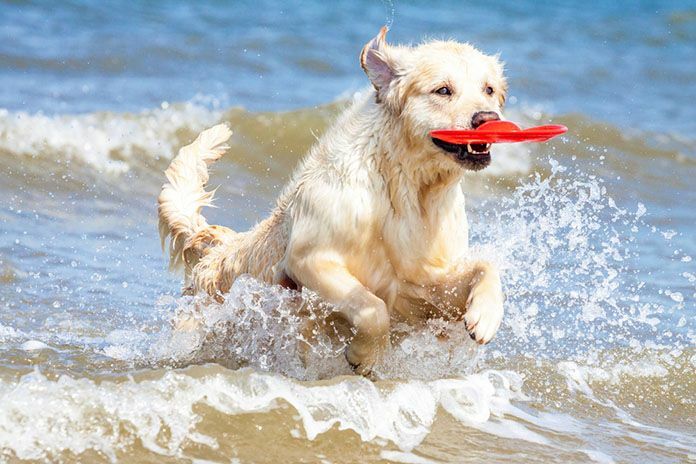 It's no surprise that Labrador Retrievers are a great choice if you want a breed to play and grab the Frisbee mid-air. They make wonderful friends and companions for their owners; they'll be happy wherever you are. Belgian Malinois plays disc in the park. The Belgian Malinois which resembles a smaller version of a German Shepherd, with a fawn, red, mahogany or black coat is another good choice of best Frisbee dogs and one of the best for dog sports. Belgian Malinois are of sheepdog breeds, and he is smart and easy to train which also makes this breed a favorite police dog. Malinois are loyal, which means that they will enjoy spending time with their owners and that they consider their owners as friends. Thanks to their sheep herding ancestry, he is very alert and makes an excellent watchdog. He is also a very energetic dog, and for him to be happy, he needs round-the-clock activity like running, hiking and biking. 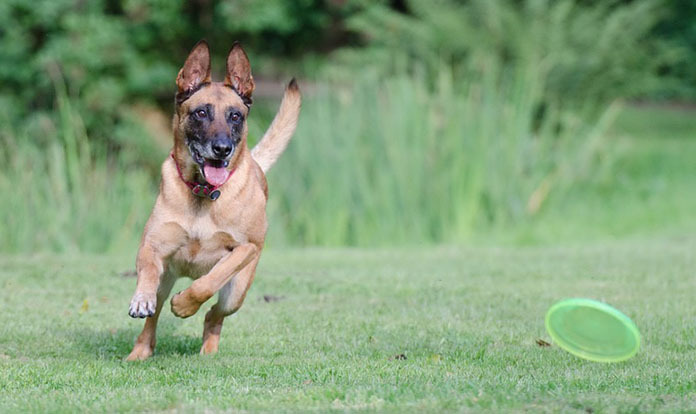 For all of these reasons, the Belgian Malinois is an excellent choice of Frisbee dog. He enjoys spending a lot of time with his owner, and his reflexes and alertness are well-tailored to playing the game. Moreover, if they've been socialized properly, they get along well with other dogs. They require a lot of exercise in their daily lives, so playing Frisbee with them is one ideal way to do so. The Golden Retriever is one of the most famous dog breed in the world. These medium-to large-sized dogs—with their lovely pale yellow to golden water-repellant coats—are great friends to humans as well as animals. They are easy to train, well-mannered, very obedient, and perform their task with speed and efficiency. Golden Retrievers are also brilliant. They are patient, especially with children, and their charming and gentle temperament ensures that everyone loves this breed. For all of these reasons, these certain dog breeds are an ideal choice for families with young children. He also likes to swim, and his peak physical condition ensures that he has fun in the water. Golden Retriever is also one of the best Frisbee dogs. He is well-behaved and follows commands and retrieves the discs without complaint. He has great reflexes, and his high energy will ensure that he will have a lot of fun while playing a game. It's for these same reasons that they are ideal dogs for competitions—Golden Retrievers are good at performing tricks. 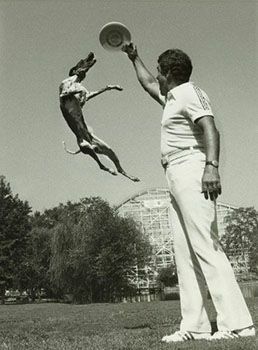 They require a decent amount of exercise, so playing Frisbee with their owners is one way of achieving this. Because they have been used as hunting dogs, they are good at tracking. They are gentle with children, so it's also no problem if your child wants to play the Frisbee game with this family dog breed. The Australian Cattle Dog, also known as Cattle Dog and Australian Heeler was originally bred to help farmers out on their ranches in (you guessed it) Australia. Thus, this dog breed have been used for cattle herding. As a working dog, they have a lot of energy: they constantly need to be active for them to be happy. An Australian Cattle Dog is loyal to his owner. Therefore, they are ideal family dogs; often, they don’t even mind sharing the house with a few house-cats. They are so affectionate to their owners that they are considered as being “Velcro” dogs; they always want to spend time with their owners. ACD are friendly dogs, and—if they’re trained properly—they love spending time with their canine friends. They are friendly and outgoing, which also helps them befriend other dogs. They are very focused: he will concentrate on a given task, and work hard to complete it until he's satisfied. Furthermore, he is also robust: he is well-adapted to different physical environments. They don't tire quickly, and thanks to their impressive athletic skills—he can walk for long distances without complaint. In particular, this is due to their origin as ranch dogs. He can also tolerate working or exercising for long hours. All in all, playing Frisbee with Australian Cattle Dogs is easy and fun. Because of their extremely active nature, love for physical activity, and affection for you and your family, playing Frisbee with them is indeed an enjoyable experience. Also, playing Frisbee will help sharpen their reflexes, engage them mentally, and ensure that they don’t get into any trouble like being destructive when bored. The Australian Shepherd, also known as the "Aussie", is a medium-sized dog and were originally bred to herd sheep in the western United States. Aussies have multicolored coats of white, tan and black. They resemble border collies somewhat, and they and can measure from 18 to 23 inches (46 cm to 58 cm) in height. Australian Shepherds are brave, they are ready to take on new challenges and start new adventures. They are playful and joyous well into their adult years. They are affectionate toward their owner and love spending time with them. On top of that, they are energetic, love playing games and also loves to learn new things. He requires a lot of exercises and mental stimulation; one short walk a day will not make the cut. He is very easy to train; this is because Aussies are an intelligent breed, and if socialize early, they usually aren't aggressive. For all of these reasons, Aussies are an excellent breed that excels at dog sport such as Frisbee. He will get a chance to bond with his owner and work out all of its muscles at the same time. He is a natural retriever; he would happily spend his waking hours catching and retrieving. Since playing Frisbee with dogs is a common sport you can play it not only with your furry dog but also with the dogs of your friends and other dog owners. Aussies will be able to get their much-needed socialization via playing with their doggy friends. 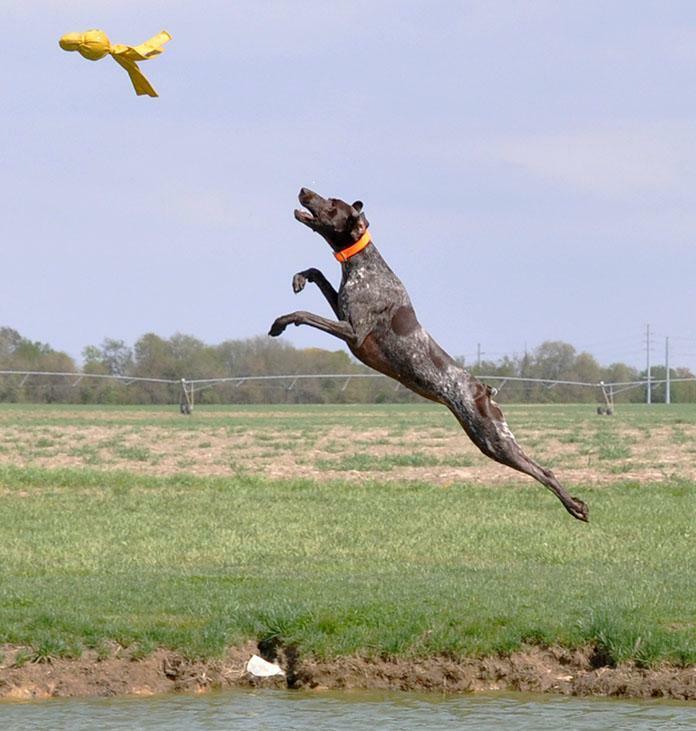 German Shorthaired Pointer (GSP) is an energetic, versatile hunting breed that was developed in Germany in the late 1880's. Its muzzle is broad and powerful with sturdy legs that can run up to a hundred miles a day. They are a very athletic breed that needs adequate rigid exercises and enjoys active outdoor games, which is why they're best suited for active families or athletic owner. German Shorthaired Pointer protective and alert nature makes him an excellent watchdog in your home. They are affectionate, loving and extremely loyal to his owner. GSP are friendly and usually great with other dogs. They like to spend time and socialize with its family members, especially outdoors. For this reason, they are a great companion for individuals who generally love to run, jog, swim, hike, hunt and of course play and fetch Frisbee; and an ideal pet for an outdoorsy family. If left alone for an extended period, he can easily be depressed, become very nervous and destructive. The German Shorthaired Pointer is an excellent choice of Frisbee dog not only because of his athleticism but also, because he is intelligent and is extremely responsive. Playing Frisbee with him is a great way to wear him out and burned that extra energy. Keep in mind that GSP is somewhat not easy to train and gets distracted easily, but if you can properly train a German Shorthaired Pointer, he can be obedient and will acknowledge you as a leader, follow your command and respect you. The Weimaraner, also known as "Gray Ghost," is an energetic, athletic dog that is moderately large. They were originally bred for hunting in the early nineteenth century. Weim coats are mouse-gray and silver in color, and they generally measure 22 to 27 inches (56 - 69 cm) in height. This breed is popular as a sportsman's dog and as a family pet. Regarding temperament, a Weim is a versatile working dog, intelligent, obedient and loyal. He is quite energetic and requires a lot of vigorous exercises and mental stimulation to be happy. He is affectionate toward his owners, and enjoy spending human companionship, including children. Keep in mind that they are not an independent breed, and when left alone for too long, he may develop severe separation anxiety. Also, this breed is not suitable if you have cats or rabbits at home, because of their urge to hunt they can be aggressive towards small animals. 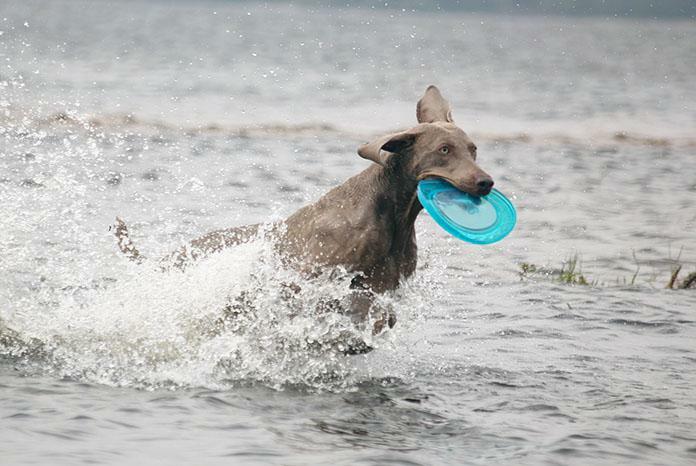 Weimaraners can be one of the best Frisbee dogs, because they are intelligent, have a great level of stamina, they do have powerful muscles with swift gait, and excel retrieving both on land and in the water. As such, he will be able to chase the flying disc and catch it with an excellent reflex. American Pit Bull Terriers don’t sound like the friendliest dogs ever, but a well-bred Pit Bull might be your favorite canine companions ever. This breed are very misunderstood; they are not violent and aggressive, but rather obedient, hard-working dogs who like a challenge. In consequence, they are a good dog to have in competitions, including Frisbee games. One reason for this is that they are very intelligent. Learning commands is easy for Pit Bulls, and they want to please their owners by performing some tricks. American Pit Bull Terriers are loving and affectionate; if they have been trained and socialized properly they make ideal companions for children. He enjoys spending time with his owners and play outdoor games with them. They are so loyal that, in some cases, American Pit Bull Terriers have defended their family at risk of their lives. He also has a lot of energy and acts like a puppy, even when he's an adult. He needs to play and exercise a lot so that he can remain happy and healthy. Proof that they are one of the best Frisbee dogs lies in the fact that Wallace﻿﻿ — a stray dog who was wanted by no one eventually grew up to become a Frisbee champion. In 2005, he was quite close to being put down in a shelter in Minnesota on account of his aggressive behavior. However, he was being treated unfairly in part because of the negative stereotypes associated with Pit Bulls (even though that term technically refers to several breeds, many of whom are harmless). He was adopted by Andrew “Roo” Yori and his wife Clara; together, the two raised him with patience, love and kindness. Within two years, he had become a world-class Frisbee champion. He won the Cynosport World Games in 2006 and in 2007 he won the Purina Pro Plan Incredible Dog Challenge National Championship for flying disc. 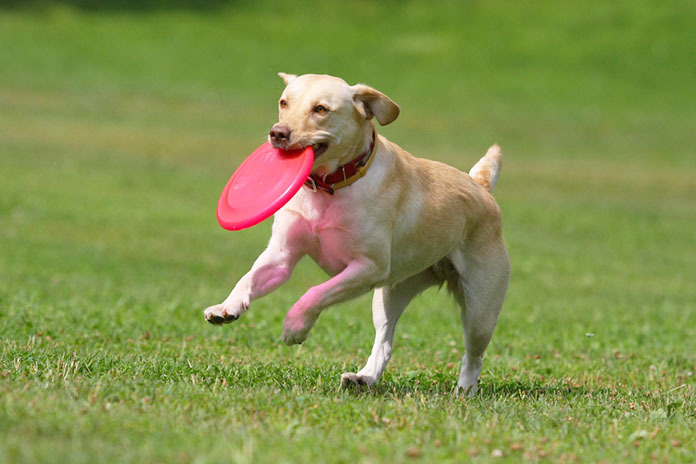 Playing Frisbee with your dog is a lot of fun, it's also an amazing way for your furry friend to stay in shape. This game can hone their reflexes as they run and jump to the best of their ability. Because Frisbee is usually played with other dogs, these ten breeds we’ve listed here—name them—will definitely be able to socialize with their canine friends, and thus improve their well-being. Moreover, most of these breeds are energetic and fun-loving, so playing Frisbee is a wonderful way of dealing with their excess energy. Likewise, because these dog breeds are intelligent and keenly aware of their surroundings, playing Frisbee with them will stimulate them intellectually as well as physically. So, if you're thinking about getting a dog and have lots of energy to spare, consider getting one of these best Frisbee dogs. Help your furry bud practice his Frisbee skills while you enjoy spending time with him and have a stronger bond with your dog. Thanks for this list of disc dog breeds! My friend’s Labrador Retriever was so addicted to catching Frisbee. He can play it all day. 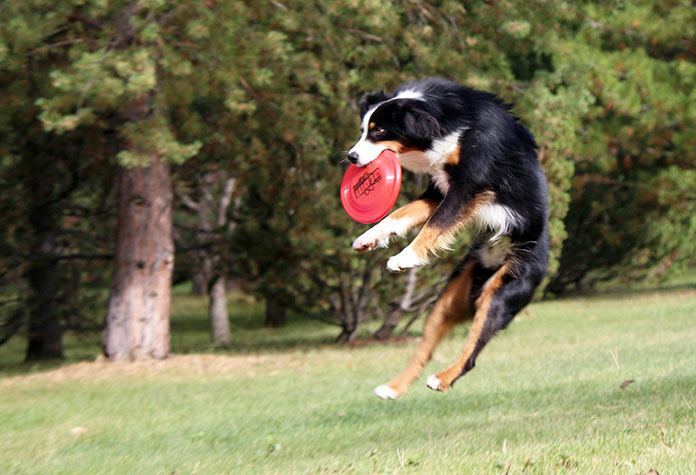 My Aussie go crazy over flyer frisbee. In the following months, I’m trying to do more technical throws like Backhand and Scoober. Anyway, thank you for the information.